Chiropractic care is a well-known alternative treatment option commonly utilized to treat symptoms of sciatica. Sciatica is characterized as radiating pain that originates in the lower back which then travels down the buttocks and hips into the leg and foot as a result of the compression of the sciatic nerve. Symptoms generally develop on a single side of the body, however, sciatica may occur on both sides of the human body. Sciatic nerve pain can vary in frequency and intensity from person to person and it’s commonly described as a dull, sharp, pins and needles sensation similar to electric shocks. Other symptoms include, burning, numbness and tingling sensations. Common disorders known to cause sciatic nerve pain include, piriformis syndrome or compression caused by the inflammation of the piriformis muscle, subluxations or misalignments of the lumbar spine, bulging or herniated discs, pregnancy, tumors and non-spinal disorders like diabetes and constipation. Because many disorders can cause sciatica, the proper diagnosis of the source of the symptoms of each individual is essential towards every patient’s treatment requirements. Diagnostic testing for sciatic nerve pain includes x-ray, MRI, CT scan and/or electrodiagnostic tests. These examinations can help determine possible contraindications to chiropractic care. Chiropractic care focuses on the diagnosis, treatment and prevention of a variety of injuries and/or conditions affecting the musculoskeletal and nervous system by carefully restoring the original alignment of the spine through the use of spinal adjustments and manual manipulations, among other types of treatment methods. The purpose of chiropractic care is to naturally increase the human body’s ability to heal itself without the need for drugs/medication and/or surgery. A chiropractor can provide a variety of treatment methods depending on the source of a patient’s sciatic nerve pain. A common treatment plan for sciatic nerve pain performed by a chiropractor may include spinal adjustments and manual manipulations, ice/cold therapies to reduce inflammation, ultrasound for increasing circulation, TENS or transcutaneous electrical nerve stimulation and lifestyle modifications, such as nutritional advice, fitness recommendations and sleep scheduling. Other treatment methods commonly utilized by a chiropractor to treat sciatica include, flexion-distraction therapy, spinal decompression therapy and the McKenzie therapy. Flexion-distraction therapy is a gentle procedure utilized for neck and back pain that increases the intervertebral disc height, allowing each disc to assume its central position in order to decrease tension, relieve irritation of the spinal nerve and improve circulation. Flexion-distraction therapy can restore body functions as well as relieve pain. Spinal decompression therapy involves intermittent stretching of the spine in a controlled manner utilizing a traction table or similar motorized device to create a negative intradiscal pressure in order to relieve back pain and/or radiating pain by promoting the passage of healing nutrients into the disc and providing a better healing environment for bulging or herniated discs. And finally, the McKenzie therapy is a standardized approach to both the assessment and treatment of sciatica. The treatment method requires a patient to participate in a series of physical activities in order to evaluate the patient’s pain response and determine the health issue. The McKenzie therapy then utilizes that information to develop a fitness routine with a focus on alleviating painful symptoms. Although chiropractic care is a safe and effective alternative treatment option commonly utilized to treat symptoms of sciatica, sciatica can be caused by disorders beyond the limit of chiropractic care. 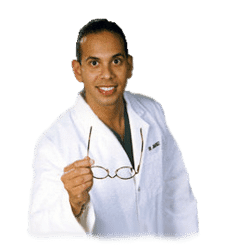 If a doctor of chiropractic, or chiropractor, determines that a patient’s disorder requires treatment from another type of specialist, they may refer the individual to another healthcare professional for further treatment. In several cases, the referring chiropractor may continue chiropractic care while co-managing the patient’s treatment with the other specialist. 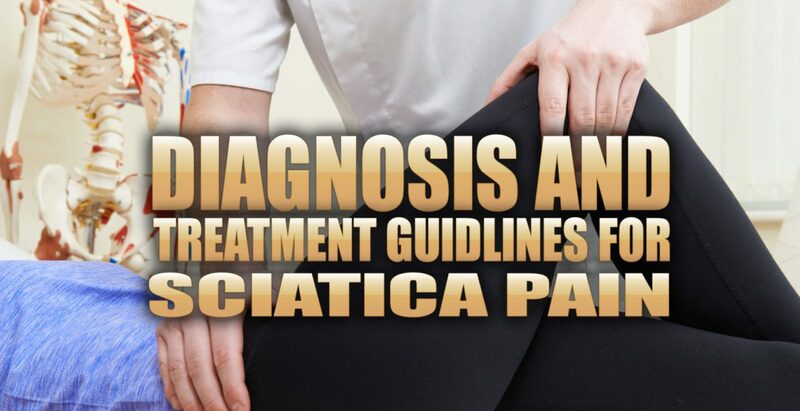 Furthermore, the purpose of the following article is to demonstrate a variety of treatment guidelines on the diagnosis and treatment of sciatica. However, because the information regarding the prevalence of the source of sciatica and its response to specific treatment methods is lacking, further research studies are still required to determine the efficiency of the treatment guidelines mentioned below. Sciatica affects many people. The most important symptoms are radiating leg pain and related disabilities. Patients are commonly treated in primary care but a small proportion is referred to secondary care and may eventually have surgery. Many synonyms for sciatica appear in the literature, such as lumbosacral radicular syndrome, ischias, nerve root pain, and nerve root entrapment. In about 90% of cases sciatica is caused by a herniated disc with nerve root compression, but lumbar stenoses and (less often) tumours are possible causes. The diagnosis of sciatica and its management varies considerably within and between countries—for example, the surgery rates for lumbar discectomy vary widely between countries. [w1] A recent publication confirmed this large variation in disc surgery, even within countries. This may in part be caused by a paucity of evidence on the value of diagnostic and therapeutic interventions and a lack of clear clinical guidelines or reflect differences in healthcare and insurance systems. This review presents the current state of science for the diagnosis and treatment of sciatica. We identified systematic reviews in the Cochrane Library evaluating the effectiveness of conservative and surgical interventions for sciatica. Medline searches up to December 2006 were carried out to find other relevant systematic reviews on the diagnosis and treatment of low back pain. Keywords were sciatica, hernia nuclei pulposi, ischias, nerve root entrapment, systematic review, meta-analysis, diagnosis, and treatment. In addition we used our personal files for other references, including publications of recent randomised clinical trials. Finally we checked the availability of clinical guidelines. Sciatica is medically defined as a collective group of symptoms, rather than a single injury and/or condition, commonly characterized by radiating pain along the sciatic nerve in the lower back, which runs down the buttocks and into both legs and feet. Sciatica generally occurs along a single side of the body although it can rarely affect both sides of the human body. Sciatic nerve pain can manifest as a result of a variety of injuries and/or conditions, such as a bulging or herniated disc, which can often make it difficult for healthcare professionals to properly treat it. 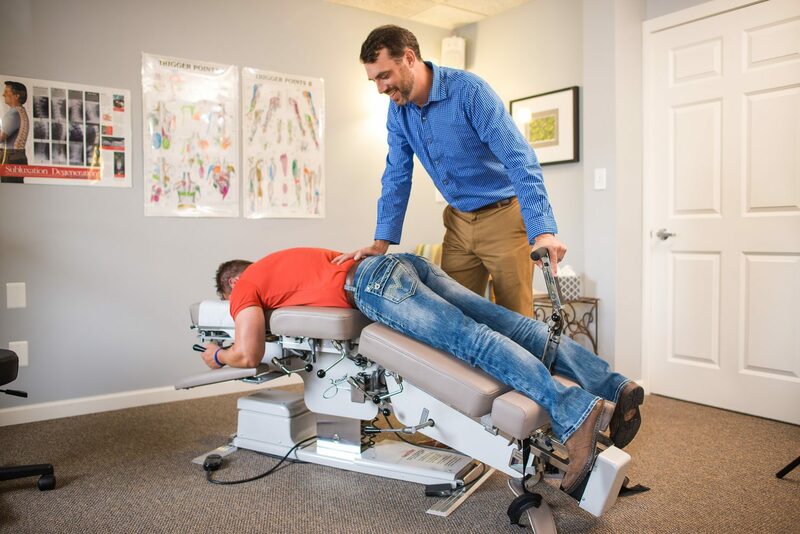 The role of a chiropractor is to determine the source of a patient’s sciatica in order to utilize the best treatment method for their specific health issue. A chiropractor, or doctor of chiropractic, will commonly use spinal adjustments and manual manipulations, among other treatment methods, to carefully restore the original integrity of the spine and improve symptoms of sciatica. Chiropractic care can increase the human body’s potential to naturally heal itself. Sciatica is mainly diagnosed by history taking and physical examination. By definition patients mention radiating pain in the leg. They may be asked to report the distribution of the pain and whether it radiates below the knee and drawings may be used to evaluate the distribution. Sciatica is characterised by radiating pain that follows a dermatomal pattern. Patients may also report sensory symptoms. Physical examination largely depends on neurological testing. The most applied investigation is the straight leg raising test or Lasègue’s sign. Patients with sciatica may also have low back pain but this is usually less severe than the leg pain. The diagnostic value of history and physical examination has not been well studied. No history items or physical examination tests have both high sensitivity and high specificity. The pooled sensitivity of the straight leg raising test is estimated to be 91%, with a corresponding pooled specificity of 26%. The only test with a high specificity is the crossed straight leg raising test, with a pooled specificity of 88% but sensitivity of only 29%. Overall, if a patient reports the typical radiating pain in one leg combined with a positive result on one or more neurological tests indicating nerve root tension or neurological deficit the diagnosis of sciatica seems justified. Below shows the signs and symptoms that help to distinguish between sciatica and non-specific low back pain. What is the Value of Imaging? Diagnostic imaging is only useful if the results influence further management. In acute sciatica the diagnosis is based on history taking and physical examination and treatment is conservative (non-surgical). Imaging may be indicated at this stage only if there are indications or “red flags” that the sciatica may be caused by underlying disease (infections, malignancies) rather than disc herniation. Diagnostic imaging may also be indicated in patients with severe symptoms who fail to respond to conservative care for 6-8 weeks. In these cases surgery might be considered and imaging used to identify if a herniated disc with nerve root compression is present and its location and extent. It is important as part of the decision to operate that the clinical findings and symptoms correspond well with the scan findings. 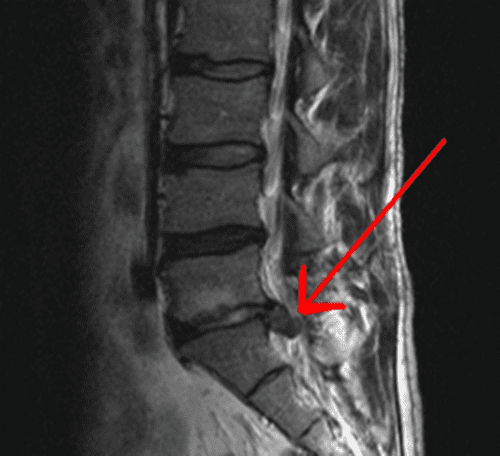 This is especially relevant because disc herniations identified by computed tomography or magnetic resonance imaging are highly prevalent (20%-36%) in people without symptoms who do not have sciatica. [6, w3] In many people with clinical symptoms of sciatica no lumbar disc herniations are present on scans. [7, 8] At present no one type of imaging method shows a clear advantage over others. Although some authors favour magnetic resonance imaging above other imaging techniques because computed tomography has a higher radiation dose or because soft tissues are better visualised,[9, 10] evidence shows that both are equally accurate at diagnosing lumbar disc herniation. Radiography for the diagnosis of lumbar disc herniation is not recommended because discs cannot be visualised by x rays. What is the Efficacy of Conservative Treatments for Sciatica? Conservative treatment for sciatica is primarily aimed at pain reduction, either by analgesics or by reducing pressure on the nerve root. A recent systematic review found that conservative treatments do not clearly improve the natural course of sciatica in most patients or reduce symptoms. Adequately informing patients about the causes and expected prognosis may be an important part of the management strategy. However, educating patients about sciatica has not been specifically investigated in randomised controlled trials. The information below summarises the evidence of effectiveness for commonly available conservative treatments for sciatica, including injection therapy. Strong evidence of effectiveness is lacking for most of the available interventions. Little difference in effect on pain and functional status has been shown between bed rest and advice on staying active. As a result of this finding, bed rest—for a long time the mainstay of treatment for sciatica—is no longer widely recommended. [w2, w4] Analgesics, non-steroidal anti-inflammatory drugs, and muscle relaxants do not seem to be more effective than placebo in reducing symptoms. Evidence for opioids and various compound drugs is lacking. A systematic review reported that no evidence exists for traction, non-steroidal anti-inflammatory drugs, intramuscular steroids, or tizanidine being superior to placebo. This review suggested that epidural injections of steroid might be effective in patients with acute sciatica. However a more recent systematic review of a larger number of randomised trials reported that there was no evidence of positive short term effects of corticosteroid injections and that the long term effects were unknown. The same systematic review reported that active physical therapy (exercises) seemed not to be better than inactive (bed rest) treatment and other conservative treatments, such as traction, manipulation, hot packs, or corsets). What is the Role of Surgery in Sciatica? Surgical intervention for sciatica focuses on removal of disc herniation and eventually part of the disc or on foraminal stenosis, with the purpose of eliminating the suspected cause of the sciatica. Treatment is aimed at easing the leg pain and corresponding symptoms and not at reducing the back pain. Consensus is that a cauda equina syndrome is an absolute indication for immediate surgery. Elective surgery is the choice for unilateral sciatica. Until recently only one relatively old randomised trial was available that compared surgical intervention with conservative treatment for patients with sciatica. This study showed that surgical intervention had better results after one year, whereas after four and 10 years of follow-up no significant differences were found. A Cochrane review summarised the available randomised clinical trials evaluating disc surgery and chemonucleolysis. In chemonucleolysis the enzyme chymopapain is injected in the discus with the purpose of shrinking the nucleus pulposus. The review reported better results with disc surgery than with chemonucleolysis in patients with severe sciatica of relatively long duration varying from more than four weeks to more than four months. Chemonucleolysis was more effective than placebo. Indirectly therefore the review suggested that disc surgery is more effective than placebo. On the basis of data from three trials the authors concluded that evidence is considerable that surgical discectomy provides effective clinical relief for carefully selected patients with sciatica as a result of lumbar disc prolapse that fails to resolve with conservative care. A recent review came to the same conclusion. The Cochrane review further concluded that the long term effects of surgical intervention are unclear and that evidence on the optimal timing of surgery is also lacking. Two additional randomised controlled trials have been published comparing disc surgery with conservative treatment. One trial (n=56) compared microdiscectomy with conservative treatment in patients who had had sciatica for six to 12 weeks. Overall, no significant differences were found for leg pain, back pain, and subjective disability over two years of follow-up. Leg pain, however, seemed to initially improve more rapidly in patients in the discectomy group. 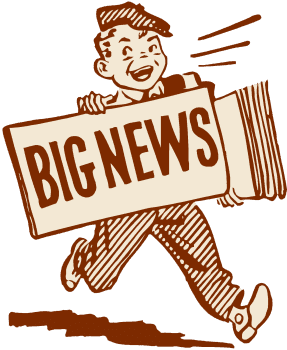 The large spine patient outcomes research trial (a randomised trial) and related observational cohort study was carried out in the United States. [20, 21] Patients with sciatica for at least six weeks and confirmed disc herniation were invited to participate in either a randomised trial or an observational cohort study. Patients in the trial were randomised to disc surgery or to conservative care. Patients in the cohort study received disc surgery or conservative care based on their preference. In the randomised trial (n=501) both treatment groups improved substantially over two years for all primary and secondary outcome measures. Small differences were found in favour of the surgery group, but these were not statistically significant for the primary outcome measures. Only 50% of the patients randomised to surgery received surgery within three months of inclusion compared with 30% randomised to conservative care. After two years of follow-up 45% of patients in the conservative care group underwent surgery compared with 60% in the surgery group. The observational cohort included 743 patients. Both groups improved substantially over time, but the surgery group showed significantly better results for pain and function compared with the conservative group. The authors did mention caution in interpreting the findings because of potential confounding by indication and because outcome measures were self reported. The results indicate that both conservative care and disc surgery are relevant treatment options for patients with sciatica of at least six weeks’ duration. Surgical intervention may provide quicker relief of symptoms compared with conservative care, but no large differences have been found in success rate after one or two years of follow-up. Patients and doctors may thus weigh the benefits and harms of both options to make individual choices. This is especially relevant because patients’ preference for treatment may have a direct positive influence on the magnitude of the treatment effect. What are the Recommendations in Clinical Guidelines? Although in many countries clinical guidelines are available for the management of non-specific low back pain this is not the case for sciatica. Below shows the recommendations for sciatica (lumbosacral radicular syndrome) in clinical guidelines recently issued by the Dutch College of General Practice. 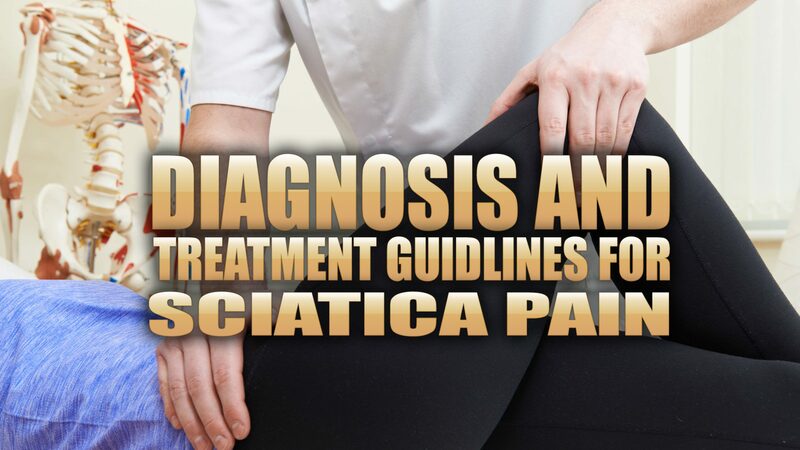 [w4] After excluding specific diseases on the basis of red flags, sciatica is diagnosed on the basis of history taking and physical examination. Initial treatment is conservative, with a strong focus on patient education, advice to stay active, continuing daily activities, and adequate treatment for pain. In this phase imaging has no role. Referral to a medical specialist—for example, neurologist, rheumatologist, spine surgeon—is indicated in patients whose symptoms do not improve after conservative treatment for at least 6-8 weeks. In these referred cases surgery may be considered. Immediate referral is indicated in cases with a cauda equina syndrome. Acute severe paresis or progressive paresis are also reasons for referral (within a few days). More evidence based information has become available on the efficacy of surgical care compared with conservative care for patients with sciatica. Although evidence is limited, initial findings suggest no important differences in long term (one or two years) effect between these two approaches. This finding may be partly explained by patients who initially received conservative care later undergoing disc surgery. In all available studies it seems that a substantial proportion of patients improve over time. This holds true for patients undergoing surgery or receiving conservative care. Patients undergoing disc surgery are more likely to get quicker relief of leg symptoms than patients receiving conservative care. If symptoms do not improve after 6-8 weeks patients may opt for disc surgery. Those who are hesitant about surgery and can cope with their symptoms may opt for continued conservative care. Patient preference is therefore an important feature in the decision process. Since the mid-1990s a switch has occurred in the management of sciatica from passive treatments, such as bed rest, to a more active approach, with patients being advised to continue their daily activities as much as possible. More information is needed on the importance of clinical signs and symptoms for the prognosis of sciatica and the response to treatment. This includes the value of size and location of the disc herniation, visible nerve root compression, sequestration, and the results of history taking and physical and neurological examinations. Subgroup analysis in a Finnish trial showed that discectomy was superior to conservative treatment in patients with disc herniation at L4-5. No strong evidence exists for or against the efficacy of many of the available conservative treatments. Much progress can be achieved here. Questions remain about the efficacy of analgesics for sciatica and the value of physical therapy and of patient education and counselling. No trial has yet evaluated the effectiveness of behavioural treatment and multidisciplinary treatment programmes. Tumour necrosis factor α has been identified in animal and human studies as one factor in the development of sciatica. [23, 24] The first randomised trial evaluating a tumour necrosis factor α antagonist in patients with sciatica did not find a positive result. After an episode of lumbago during a vacation I continuously had low back pain and tingling feet for about nine months. Then suddenly my right foot started to hurt badly and after a while the pain became so severe that I was unable to leave my house. The specialist ordered an MRI (magnetic resonance imaging) scan and it revealed a large lumbar disc herniation. Since it only got worse after that I decided to have surgery. After the operation I recovered quickly and the back pain and leg pain were completely gone. I soon was able to go back to work and rebuild my social life. Unfortunately after a couple of months the low back pain and the other symptoms returned, although not as severe as before surgery. A new MRI scan now revealed two small disc herniations and two bad intervertebral discs. The specialist told me that it was too early for a second operation. Now it is unclear to me what the doctor can do about it and I don’t even know which measures I can take myself. The constant back and leg pain are greatly interfering with my work and my social life. I sometimes feel like an elderly person because of my physical limitations. I try to stay positive, but it is hard to cope with the uncertainty. My complaints started about four months ago with pain in the lower back. Soon after the pain radiated into my legs, for which I went to my general practitioner. His analysis was no herniated disc. A muscle relaxant in combination with referral to a physiotherapist would reduce the symptoms. Three weeks of physiotherapy followed by several treatments by a chiropractor did not provide any symptom relief. In fact the symptoms became worse—especially during walking and standing. Lying down and cycling were much better tolerated. Additional complaints were reduced strength in the left leg, not being able to stand on the heel or toes, a cold feeling in the lower leg at the end of the day, while in the morning it felt like standing in a bunch of needles. About one month ago a neurologist diagnosed a herniated disc on the right side based on an MRI scan that was taken. However, this could not explain the symptoms in the left leg. The symptoms in the left leg could be due to spinal stenosis. The complaints were not severe enough to recommend surgery and the neurologist told me that a substantial improvement was to be expected within a period of 3-4 months. His advice was to continue normal daily activities as much as possible. At present (one month later) I feel some improvement of my symptoms. Contributors: BWK wrote the first draft. MWvT and WCP critically appraised and improved the manuscript. BWK is guarantor. Provenance and peer review: Commissioned; peer reviewed. In conclusion, chiropractic care is a popular alternative treatment option commonly utilized to treat sciatica symptoms. While sciatic nerve pain can occur due to a variety of injuries and/or conditions, the purpose of chiropractic care is to determine the source of a patient’s sciatica in order to properly treat their symptoms using a variety of treatment methods. The article above demonstrates several treatment guidelines for sciatica, however, further research studies are required. Information referenced from the National Center for Biotechnology Information (NCBI). The scope of our information is limited to chiropractic as well as to spinal injuries and conditions. To discuss the subject matter, please feel free to ask Dr. Jimenez or contact us at 915-850-0900 .